"Brotherhood of Blue" 3-Piece Survival Set - Bowie, Folder, Paracord Bracelet | BUDK.com - Knives & Swords At The Lowest Prices! 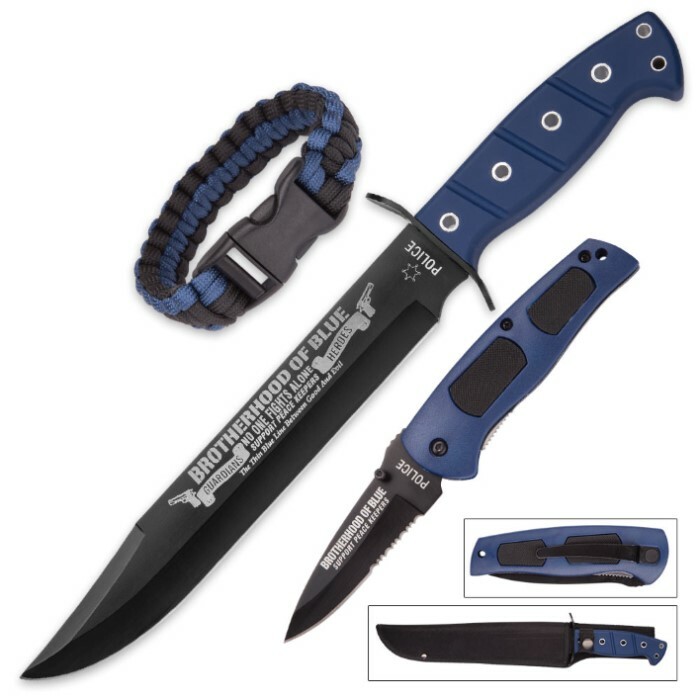 Beautifully adorned and exceedingly tough, the "Brotherhood of Blue" 3-Piece Survival Set boasts both the unwavering strength and adaptability of a seasoned SWAT operative and the elegance and style of an officer donned in full dress attire. 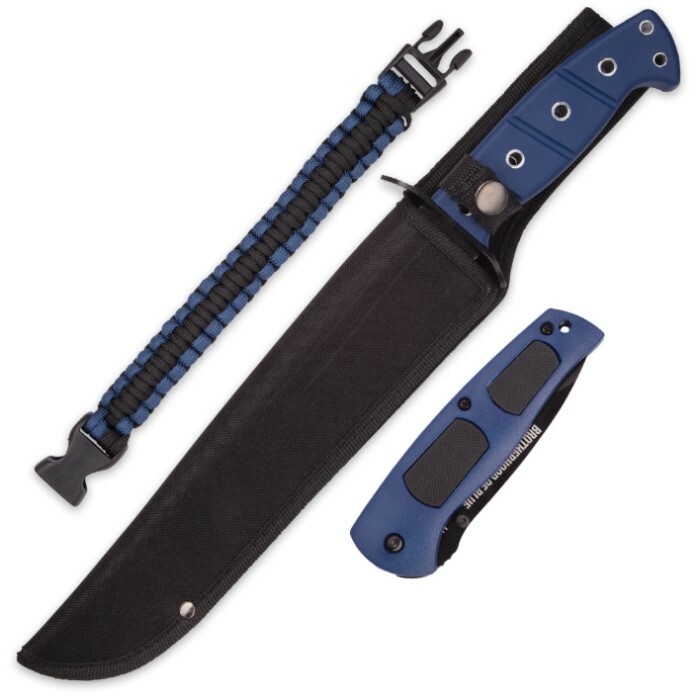 This versatile survival trifecta includes a potent bowie knife, a handy folder and a multipurpose survival bracelet, all in one convenient, surprisingly affordable ensemble. Vibrant blade etchings and a stately blue color scheme pay homage to the brave men and women of America's law enforcement agencies - from local police and sheriff's deputies to state troopers and Federal agents. "Brotherhood of Blue" is emblazoned along the spine of the bowie's imposing stainless steel clip point blade, superbly offsetting the brooding nonreflective black coating. The bold slogan is flanked by two Glock-style handguns and two waving banners, the latter of which contain fitting, honorific law enforcement titles - namely, "Guardians" and "Heroes." Additional words of tribute are etched at the heart of the bowie's stirring blade motif, including "No One Fights Alone," "Support Peace Keepers," and "The Thin Blue Line Between Good and Evil." 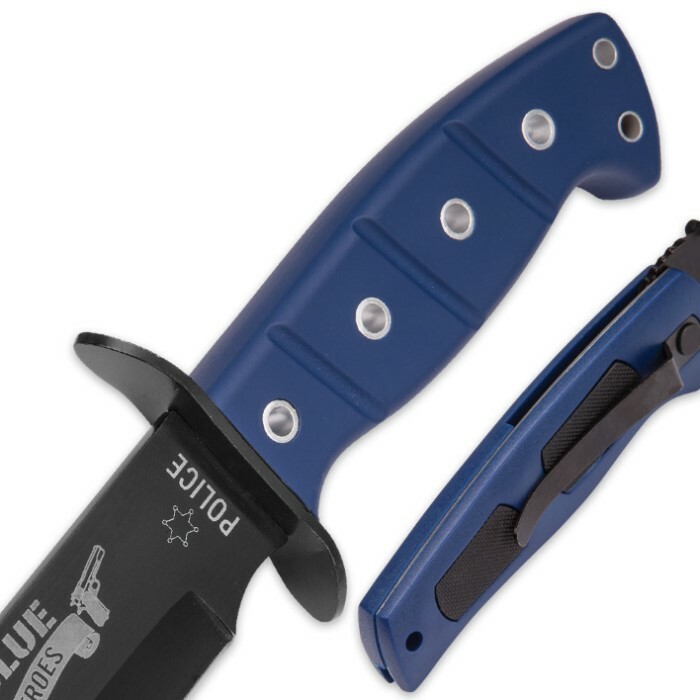 The folder's half-serrated drop point blade also features law enforcement-themed blade etchings, as well as a handy thumb stud for smooth, one-handed opening. Delicately textured rubber handle insets provide the rugged pocket knife with a comfortable, no-slip grip. Both a stylish accessory and a valuable survival tool, the bracelet is comprised of more than 7' of tough nylon paracord .The cord is carefully intertwined to yield a chic, condensed band, which is bookended by sturdy self-locking clips. Conquer the wild, storm the battlefield or enrich your display case - you can do it all with the "Brotherhood of Blue" Set! Best of all, this capable trio represents an incredible value, so you can order multiple sets without breaking the bank - one to display, one for the field and one to gift to a beloved law enforcement officer in your life. It's a heartfelt gesture sure to be remembered and cherished for a lifetime. Great for sons, daughters and/or spouses of law enforcement, as well!